The last time audiences spent time with director Alexander Payne, it was in 2011’s The Descendants, the heart-wrenching, Hawaii-set dramedy about a family facing the sudden and devastating loss of a family member. With The Descendants, Payne bluntly pointed out that even those who live in a constant sunny paradise and sport floral print shirts are not immune to the harsh blows that life can unexpectedly dish out. Two years later, Payne returns with Nebraska, another frank dramedy with a heavy lean on location. Shot in nostalgic black and white and set in the small, boarded-up Americana towns of the Midwest, Nebraska is a simplistic road movie about an elderly father and his patient son on their way to collect a million dollars that may or may not be real. Along their journey they drop into the father’s hometown, a bare strip of farm country that is aging right along with the born-and-raised citizens that still make up its population. With veteran actor Bruce Dern at the helm and comedian Will Forte riding shotgun, this soft-spoken little movie is unexpectedly hilarious and overwhelming sweet. It’s a snapshot of a meat-and-potatoes family brought together through one man’s senile belief and staunch determination. It’s also about digging up the past, taking a leisurely stroll down memory lane and fondly looking back at year’s past. Nebraska introduces us to Woody Grant (played by Bruce Dern), an elderly man who receives a letter in the mail stating that he has won a million dollars. Bound and determined to collect his winnings, Woody begins walking from Billings, Montana to Lincoln, Nebraska. After being stopped on the side of the road by a police officer, Woody’s son, David (played by Will Forte), picks him up from the police station where he discovers that the million dollars that Woody believes he has won is actually just a scam to sell magazines. After David realizes that Woody isn’t going to give up trying to collect his prize money, David decides to drive him to the sweepstakes center in Lincoln so that he will understand that it is all a scam. This plan outrages David’s mother, Kate (played by June Squibb), and his brother, Ross (played by Bob Odenkirk), who strongly believe that David shouldn’t encourage his father’s hopes. Ignoring the protests, the two set out on a road trip that leads them back to Woody’s hometown of Hawthorne, Nebraska. Upon their arrival, David and Woody begin reconnecting with old friends and family members, but after word gets out about Woody’s sudden new fortune, they all quickly have their hands out for money. For a good chunk of Nebraska, the story lingers around the peeling buildings and desolate stretches of Hawthorne, a place that appears to be slowly fading from the map. It’s a town that seen some excitement back in the good old days, but now, the memories that haunt the abandoned farmhouses and boarded-up businesses are all that are left. Our characters chat about distant friendships that faded, family members that have passed on, or old American cars that have been hauled off to the junkyard, the chatter stopping when talk shifts into the present. Now the wrinkly inhabitants flock to the local buffet where the main form of entertainment is bad karaoke sung out in flat tones. The big news for the day is Woody’s return and the rumored million dollars that he has won, no one really knowing for sure if it’s true. Still, that doesn’t stop the citizens from beaming, gossiping, and proclaiming that it’s the biggest thing to happen to Hawthorne in quite some time. Even the Hawthorne newspaper jumps at the chance of doing a piece on old Woody. When David tries to explain that his father hasn’t really won anything to one eager newspaper employee, they simply shrug their shoulders and say that they’ll just do a piece on the prodigal son’s triumphant return. This grasp on the past that the citizens of Hawthorne hold so dear is complimented by the black and white cinematography from Phedon Papamichael, who provides haunting shots of rusted out Americana, photographed with misty eyed nostalgia and twinkling memories known only to the character’s themselves. And then we have veteran actor Bruce Dern, who gives an irritable and touching performance as prizewinner Woody Grant. With his shock of mad scientist hair and his drunken shuffle, Woody is a man on a mission, pausing only to have a few bottles of beer here and there. It’s clear that he is starting to slip mentally, although it’s implied that he has been a simple and gullible man his entire life. His delight over the winnings is truly lovable, even if we the audience know that there is no million dollar prize waiting for him in Lincoln. It also grows extremely difficult to watch old friends and family members try to milk money out of the poor man. It’s even worse because he has absolutely no idea they are trying to do it. While he is definitely overshadowed by Dern, former SNL comedian Will Forte does a fantastic job as David, Woody’s sweet and easy-going son who decides to let his father have his moment in the sun. June Squibb will have you doubled over in laughter as Kate, Woody’s gabbing wife who never misses an opportunity to rip him up one side and down the other. Always a woman to speak her mind, Squibb is a feisty blast, especially when she is visiting the graves of several friends and family members at a Hawthorne graveyard. Bob Odenkirk takes a minor role as Ross, David’s older brother who is fed up with Woody’s behavior and believes that they should be considering a home. Also on hand is Stacy Keach, another veteran actor who turns up as Ed Pegram, Woody’s old buddy who may not be as friendly as he first appears. While Nebraska certainly has its fair share of leisurely moments, Payne turns up the hilarity level to high when he wants to. In the early scenes, the glimpses of Woody marching by the side of the road towards Lincoln will nab a chuckle and the constant verbal beatings that Woody is subjected to from Kate will have you doubled over. When the Grant’s make it to Hawthorne, the comedy really kicks into high gear as David mingles with his deadbeat cousins, Bart and Cole, and the rest of the family tries to awkwardly reconnect. In between the hearty laughs, Payne and screenwriter Bob Nelson delicately fill us in on Woody’s past. We learn he was a man of few words and that he had an ugly experience in the Korean War, but we learn that he would do everything he could for those he cared about, making him all the more lovable. 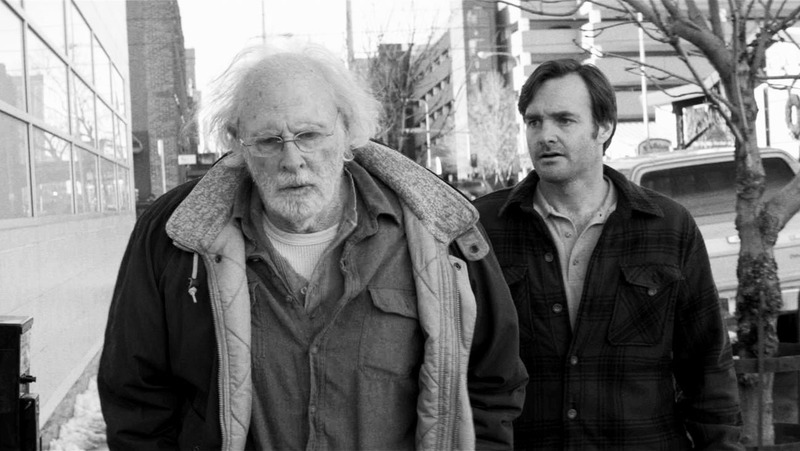 Overall, Nebraska is a sparse and atmospheric story told with timeless care and comedic warmth. It puts up a defense with a dry sense of humor, but Payne isn’t afraid to reveal a vulnerable side, especially at the bittersweet climax. Though it may be shot in black and white, the film is given plenty of color from its quirky cast of characters, especially Dern’s career high turn as Woody. 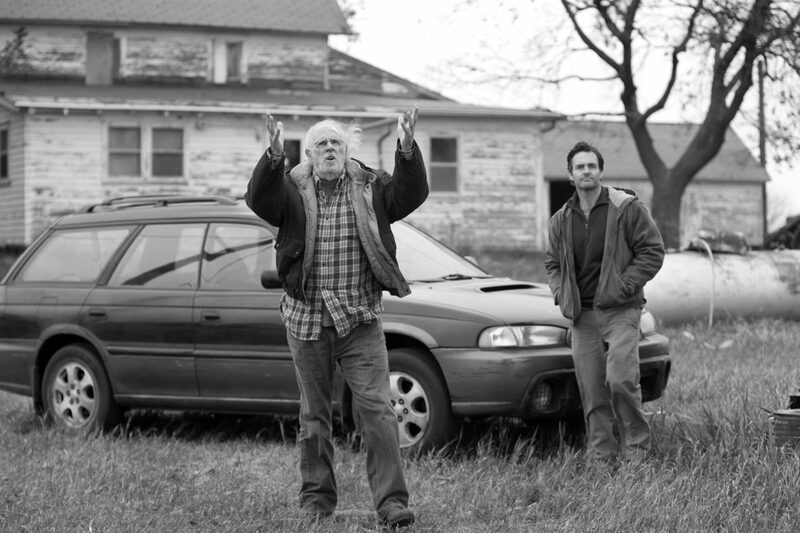 Nebraska is one of the finest films that 2013 has to offer. Posted on January 26, 2014, in REViEW and tagged 2013, alexander payne, bob nelson, bob odenkirk, bruce dern, comedy, drama, june squibb, stacy keach, will forte. Bookmark the permalink. Leave a comment.